By Tom Kertscher on Tuesday, March 29th, 2016 at 1:30 p.m.
Seeking an endorsement to help boost his presidential campaign, Republican Ohio Gov. 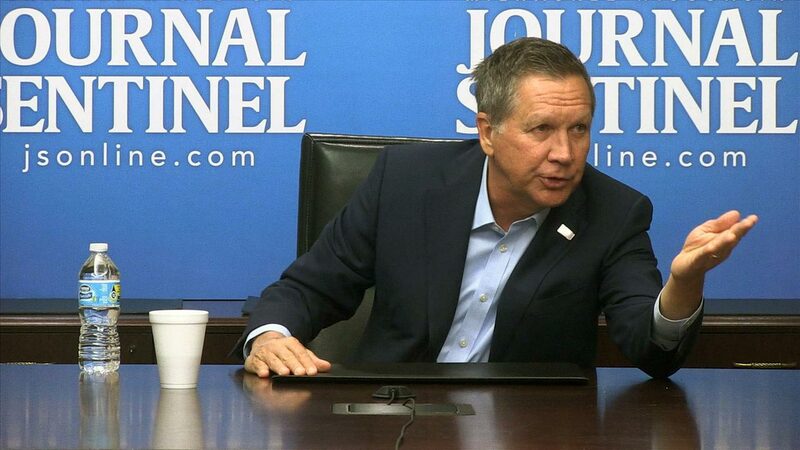 John Kasich met March 29, 2016 with the editorial board of the Milwaukee Journal Sentinel. Wisconsin’s primary election is on April 5, 2016. During his hourlong meeting with editors and reporters, Kasich made a few claims similar to ones PolitiFact has rated before. "I’m the only one who consistently wins in the fall -- by a lot." "I beat Hillary in every poll." We're not fact checking either one of those statements here. But based on polls leading up to the March 3, 2016 GOP presidential debate on in Detroit, Kasich is generally on target on both claims -- although "by a lot" is a stretch. At that debate, Kasich said that in head-to-head polls for the general election, "I beat Hillary Clinton by more than anybody, by 11 points." PolitiFact National’s rating was Mostly True. The RealClearPolitics average of recent polls at the time showed Kasich over Clinton by a margin higher than that of Florida Sen. Marco Rubio, who was still running then, or that of Texas Sen. Ted Cruz. Meanwhile, the polls showed businessman Donald Trump losing to Clinton. But Kasich did some cherry picking by alluding to one poll that gave him an 11-point edge. We found that more recent polling from RealClearPolitics also shows Kasich defeating Clinton in a general election matchup by between 4 and 7 points (although two polls show him losing to Democratic Sen. Bernie Sanders). Kasich also appears on target on this claim about his tenure as Ohio’s governor. His claim was much more modest than one he made in the August 2015 GOP debate in Cleveland. At that time, he said: "I took the state of Ohio from an $8 billion hole … to a $2 billion surplus." PolitiFact National’s rating then was Mostly True. Our colleagues found it was possible to argue over whether the first figure Kasich cited should be $6 billion rather than $8 billion. But Kasich didn’t pull that figure out of thin air, and it certainly was high by historical standards. The $2 billion figure appeared solid. But it’s worth noting Ohio’s fiscal improvement got a big assist from the national economic recovery.